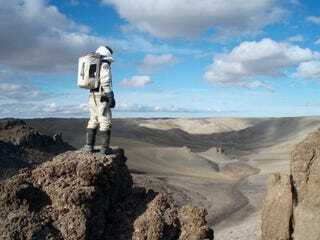 Suicide Mission to Mars? Astrobiologists say "No Thanks"
Astrobiologists seem to have trouble putting their money where their mouths are. Generally among the most ardent supporters of planetary exploration, around 2/3 of them got cold feet yesterday at the Astrobiology Science Conference 2008. During a talk entitled "A One-way Mission to Mars," famous cosmologist Paul Davies asked the audience who among them would volunteer for the first journey to to the Red Planet? About 1/3 — mostly women interestingly — raised their hands despite the fact that Davies stressed it "wouldn't be a suicide mission."